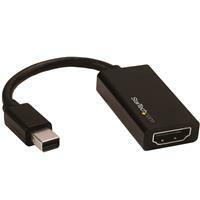 This Mini DisplayPort to HDMI® adapter lets you output HDMI video and audio from an mDP device, with support for Ultra HD 4K at 60Hz. The Mini DisplayPort adapter is the perfect accessory for any of your Microsoft® Surface™ Pro devices with mDP. The adapter lets you harness the video capabilities that are built into your Mini DisplayPort connection, to deliver the astonishing quality of UHD to your 4K 60Hz display. This makes it easier for you to multitask while using multiple monitors to work on resource-demanding applications. Unlike many 4K Mini DisplayPort to HDMI adapters that only support a 30Hz refresh rate, this adapter works with HDMI 2.0 displays that can deliver output resolutions of up to 3840 x 2160p at 60Hz. Support for HDMI 2.0 means this adapter can support bandwidth up to 18Gbps, making it an ideal solution for performing high-resolution tasks such as editing 4K video. The adapter is backward compatible with 1080p displays, which ensures compatibility with lower resolution displays such as TVs or projectors around your home or office. The compact video adapter is highly portable and lightweight. It’s the perfect accessory for your portable mDP devices, fitting easily into your laptop bag or carrying case. The portable adapter is the perfect accessory for deployment with company computers, enabling your employees to interface with BYOD (Bring Your Own Device) HDMI applications around the office, such as working at a hot-desk with an HDMI display or sharing your laptop’s screen on a boardroom projector. 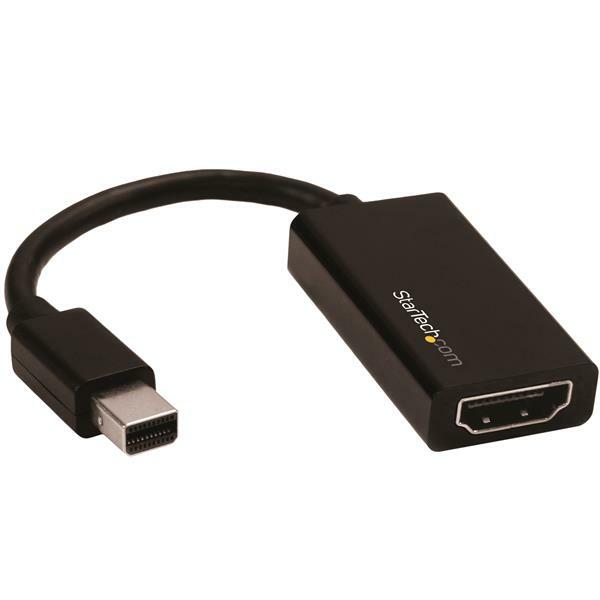 To ensure compatibility with any Mini DisplayPort output, the mDP adapter offers active conversion. Active video conversion is required to maintain 4K resolutions when converting Mini DisplayPort to HDMI. An active mDP adapter is also ideal for outputting 1080p resolutions by ensuring compatibility with graphics cards that are not capable of outputting multi-mode DP++ signals, such as ATI Eyefinity™ cards. For a hassle-free setup, the Mini DisplayPort to HDMI adapter allows for plug-and-play installation without any additional software or drivers. Note: To achieve 4K resolution at 60 Hz a DisplayPort 1.2 output and an HDMI 2.0 display are required. The MDP2HD4K60S is backed by a 3-year StarTech.com warranty and free lifetime technical support.